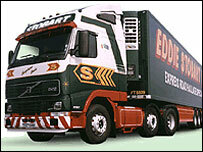 One of Britain's biggest privately-owned road haulage companies, Eddie Stobart, has been sold. The move means that Eddie Stobart, the chairman and chief executive of the Cumbrian-based company, will step down. Mr Stobart has insisted the sale of the company should not result in job losses at the firm's Carlisle depot. The firm has been sold - for an undisclosed amount - to WA Developments, based in Appleby, a company part owned by Eddie Stobart's brother, William. In a statement, the company said: "It is proposed that WA Developments (International) will acquire the shareholdings and formally take over Eddie Stobart Group on 1 November. "Following the sale, Edward Stobart plans to retire as chairman and chief executive but will be available to assist where his knowledge and experience is required." Eddie Stobart currently operates more than 1,000 trucks from depots in Europe and its distinctive trucks have a big fan base. The Transport and General Workers' Union (T&G) has given a cautious welcome to the news. Alan McGuckin, from the T&G, said staff were trying to be optimistic. "I think they are trying to look on the bright side, to see this is a positive thing for the future rather than look for the down side of it. "What has been said is that in some ways this is to try and increase investment. "There are only a limited number of big players in the industry who can deal with the very large contracts that are being put out by manufacturers and retailers. He said: "Eddie Stobart wishes to be among those big boys."